I was curious. Learning better seemed like a great skill to have today. 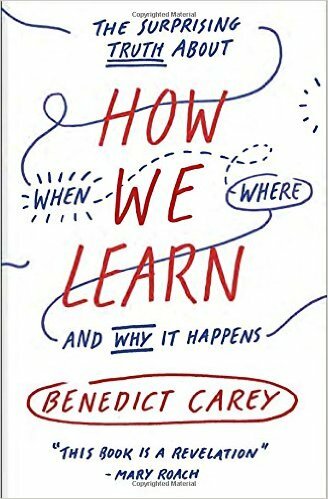 So I picked up Surprising Truth About How, When and Where We Learn and Why it Happens by Benedict Carey (2014). He integrates very old (1874) and newer studies (up to 2012) about various learning topics. I read the book, despaired of remembering all the conclusions, and then found a handy-dandy Appendix with the summary of the most important points. Mix it up. As a dedicated generalist I worried that focusing on many areas like trail running, choir, writing and photography would cut my skills in each. But it turns out that focused practice in one area limits our development of each skill. “Mixing or ‘interleaving’ multiple skills in a practice session, by contrast, sharpens our grasp of all of them.” So pausing on a trail run to rehearse the chorus of a new song or take a photograph may actually improve my skills. Action thought: Just enjoy all those various interests. Interruption is percolation time. Some of my creative projects take a long time to finish. The painting that I am working on has taken a few months and I have a few months to go. It turns out that “stopping work on a big, complicated presentation, term paper, or composition activates the project in your mind, and you’ll begin to see and hear all sorts of things in your daily life that are relevant.” And, what this means is, I need to start early on large creative projects to leave time to walk away. Action thought: Start early and walk away. Self test is best. I’ve recorded my work presentation practice and watched it back. It turns out that self-testing, like this, is one of the highest ROI study techniques there is. “Self-examination improves retention and comprehension for more than an equal amount of review time.” Explaining something to someone else is a form of self-test. Action thought: Keep recording my presentations and watching them back. Space your study time. I hadn’t yet figured out how to best learn new choir songs. This helped. “Breaking up study or practice time – dividing it into two or three sessions instead of one – is far more effective than concentrating it. It works because you have to dig up and restore what you learned the previous session and this improves memory. Action thought: Work time into the schedule of a project to walk away. Memory is a muscle. Just like our muscles, it needs a little “rest” aka time to forget in between study times or jam sessions, to build stronger memories. “The brain can sharpen a memory only after some forgetting has occurred.” Action thought: Work time into the schedule of a project to walk away. If you like to follow the ebb and flow of the research and the connections between on these and similar topics, I recommend reading Carey’s book. If you just want a few of the key takeaways without the journey, read his Appendix. Either way, you’ll learn better, more efficiently and deeper.